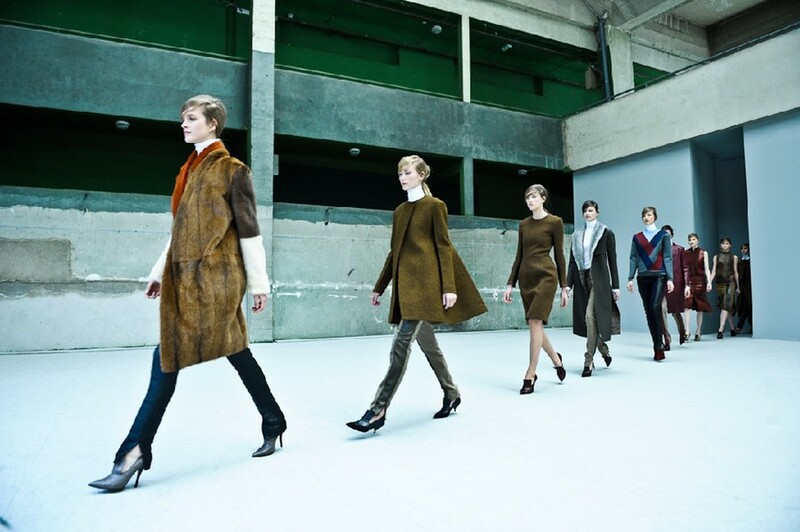 You have to admire Phoebe Philo’s sense of control in the way she has been steering Céline’s collections. She has not betrayed her strong sensibilities for the way she feels women today need (and want, judging by the audience’s Celine wearing quota) to dress. Today she impounds another stamp of authority that has nothing to do with the frou and flou of ideals/fantasies of Parisian chic that designers have been throwing to us this season. Instead, beautiful car interiors were the imaginary cocoons that Philo looked to when thinking about the way a woman’s body could be encased. We’re just going to assume we’re talking about Jaguars, Aston Martins and Bentleys (resolutely British of course) rather than flashy Alfa Romeos and Bimmers. With cars seats in mind, leather of course had to figure in and it was cut into the sides and back of skinny trousers, worked into sides of silk chiffon sleeveless shirts with a matching skirt that had movement despite the rigid leather panels as well as straight forward crackled leather jackets that contrasted in texture with the fur gilet underneath. White turtle necks cut so high as to look like fencing uniforms only added to the streamlined effect of the silhouettes which really concentrated on getting wardrobe cornerstones – the coat, a jacket, the jumper – perfectly formed in proportion. Yet despite the rigorous appearance of it all, it was Philo’s play with texture as well as a restrained use of colour that bought them to life and in this case had some slightly retro references that were almost undetectable. Jumpers with a slightly retro-tinged V-shaped pattern in brown, amber and orange and beige looking like a familiar graphic on a 70s Penguin paperback. Wood patterns that referenced dashboards but could also have been any surface from 70s furniture. The contrast of furs and crackled patent leather recalled shaggy furs draped over stiff leather sofas in retro bachelor pads. The surprising appearance of a candy pink panelled shirt with matching trousers also pointed out that we could never call Philo’s collection stark but rather it’s a testament to her sense of restraint that knows when to inject colour and texture and when not to. The Céline momentum has revved up another gear this season but you get the feeling Philo won’t take a U-turn and stray too far from the level of excellence she’s built up.